I'm a little ashamed to admit that I've had this set for a few months and never even cut it up until tonight! I'm still doing challenges for the Dare to Get Dirty series on Splitcoast so that's why this card looks to be a little out of the ordinary for me. 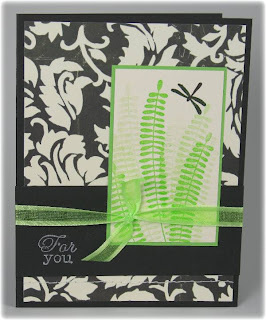 Materials used: Nature Silhouettes stamp set - Cornish Heritage Farms (Kim Hughes Collection): patterned paper - 7 Gypsies; Green Galore ink and cardstock, Very Vanilla and Basic Black cardstock - Stampin' Up! ; black and white Brilliance ink - Tsukineko; ribbon - Pink Hedgehog Papercrafts. I've been really busy lately with some family stuff, so I've been combining challenges to try and get them all done. 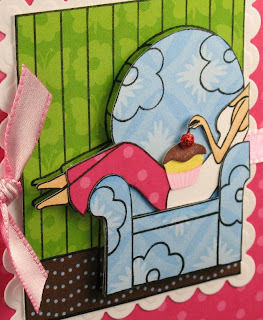 I got 2 different challenges done with this card - make a flap card and use the colors pink and black with some faux stitching. 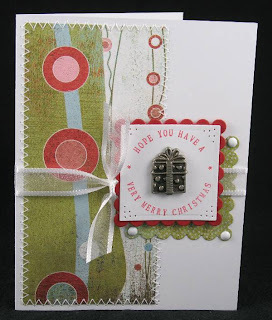 I just adore this sentiment stamp - the saying is so sweet and I love the fonts they used. Can you believe it's from a Studio G dollar set?? It also has some flower images with it, one of which I used to stamp the inside. Oh, and if you think the word happy looks a little weird, it's because I traced over it with a glitter pen and couldn't quite photograph it right. It looks really pretty in person! I deviated slightly from the tutorial for the flap card because I didn't want to use a magnetic closure. Instead, the flap tucks behind the flower and the whole ribbon/button/flower piece can be moved up and down to either secure the flap or release it. You can see how it looks open in this picture. To finish it off, I cut a piece of plain white cardstock which I stamped with one of the matching little flowers from the same stamp set. This card was really fun to make so I'm sure I'll make more in the future! Thanks to Rose Ann Reynolds for the tutorial!! 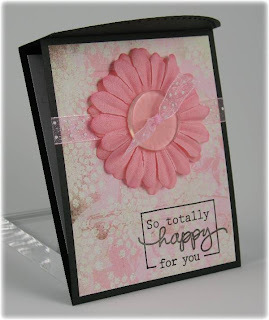 Other materials used: patterned paper - Basic Grey Sugared collection; flowers - Heidi Swapp; black cardstock and button - Stampin' Up! ; ribbon - Pink Hedgehog Papercrafts. I've been really itching to try watercoloring ever since I saw this tutorial by Leslie Miller (one of my stamping idols!). I am also using a Whipper Snapper image and I really cheated by copying the shading from the colored label on the stamp!! I have to say that it wasn't as difficult as I thought it would be. The couple times I tried previously, I used plain cardstock and as soon as it got too wet, the paper would pill up and get me really frustrated. Well, with the watercolor paper, it never pilled up even though I played and played with it. I'm really happy with how this turned out, but it took waaaaaay longer that I thought it would (a few hours!!). I know I'd probably get faster with practice, but I really have to be in the mood to spend that much time coloring one image! Thanks so much to Leslie for the inspiration and awesome, really easy to follow tutorial - You ROCK!! 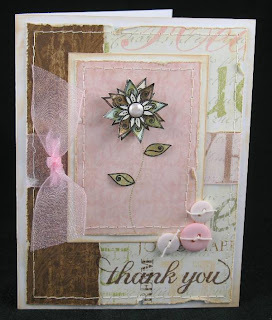 Other materials used: Rose Red cardstock and waterbrushes - Stampin' Up! ; ribbon - May Arts; brads- SEI, glitter pen - Sakura. Today's card was made using the Amy R. Friday Sketch #24. I just got the Bitty Baby Blessings set from Papertrey (yes, I'm a little behind the times!) and wanted to ink it up, so I did! Not too much to explain except the main part of the carriage was paper pieced and popped up, as were both wheels. 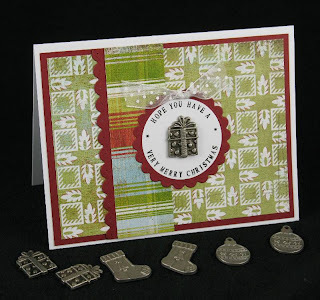 The little Baubles are from Stamping Bella and the ink and cardstock are Berry Sorbet, also from Papertrey. I am so thrilled to have received this award from 2 wonderful bloggers: first from my SBS-13 sister Jo, and then from Donna who can always make me smile with her awesome DoodleFactory cards. You may already know that I am always a rule breaker when it comes to awards so I simply cannot start following them now! I would like to dedicate this award to all of my SBS-13 sisters and hope that you'll go and visit all of their blogs as we have such a talented group with a very wide range of styles! 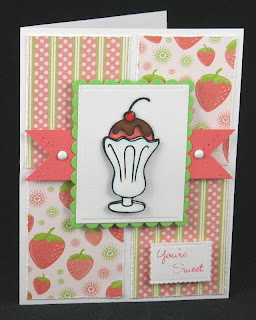 Next, please go visit Donna's blog as she is pretty new to visiting my blog also and does such wonderful cards!! AND she recently became a DT member for Starving Artistamps and you can get a discount code from this post or you can find it in her sidebar. Thanks so much to Jo and Donna - it was so sweet of you both to think of me!! As you can guess from the title of this post, today's card was created for 2 Verve challenges. 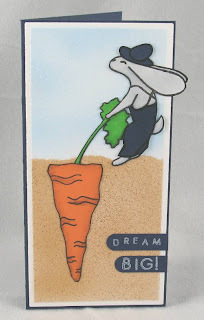 The first was the July Product Parade challenge, which was to make an ATC. I just recently got the Thankful Blossoms set and really wanted to play with layering the flowers. I tried the larger size first, but the resulting flower was too big for the ATC, so I made another flower out of the smaller size and it fit perfectly. 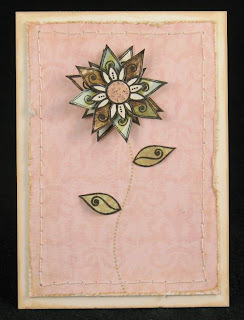 The patterned paper for the background, flower, and leaves are all from an old Studio K paper pad. The flower has 4 layers popped up with a combination of foam and 1/4" hole punches, and the little leaves are partially popped up using 1/8" hole punches. First I ran my scissors blade over the base cardstock's edges, then I sewed the background paper to the base cardstock and used Antique Linen Distress Ink all over the threads and edges to tone down the white color of the cardstock. 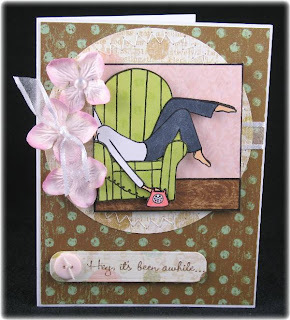 The second challenge was the Meet the Verve Divas Challenge #3 which was to use at least 3 buttons. I took the ATC above and turned it into a full-sized card for this challenge. You may have noticed that I added a bit of Tulip dimensional pearl paint to the flower just on a whim. I was going to add a half pearl, but the flower was already so tall, I didn't want that much extra height (although I may already have to pay extra postage because of the flower!). One last note - I taped the wide organdy ribbon around the base layer and then took an extra length of ribbon to make the knot. Instead of just trying the extra bit around the other ribbon (which would have really scrunched it up because it's so wide), I punched 2 holes on either side of the base ribbon to tie my knot through. I don't like knotting ribbon and then glueing it to my cards because they usually fall off. I much prefer to actually tie them to something on the card to keep them secure. TFL! Other materials used: white cardstock - Georgia Pacific; buttons - SEI; Mellow Moss ink and pink organdy ribbon - Stampin' Up! ; Dark Chocolate ink - Papertrey Ink; Graphite Black Brilliance ink - Tsukineko; Waxy Flax - Close to My Heart. I don't think there's much to explain. 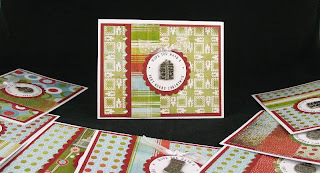 I used the same set-up on my Just Rite stamper that I used on these cards, just stamped in red ink instead. TFL! 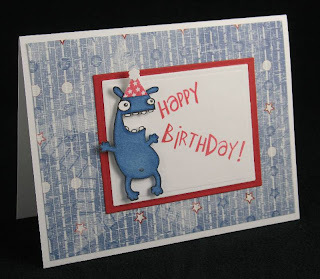 Today's card was made for the 40th MFT sketch challenge. I had been wanting to ink up my new set, Call Me, for a while now and the square shape of the image fit perfectly into the sketch. I stamped the image once each onto white cardstock, pink patterned paper, brown PP, and then twice onto green PP. After the ink was thoroughly dry, I colored the white CS version with Copics. I wanted a little more of a heather gray look to her pants, so I colored then first with C-7, then airbrushed over that with the colorless blender. It's a pretty subtle effect, but I think it looks a little more "textured" than just the plain gray. You can see more of the dimension in this shot. 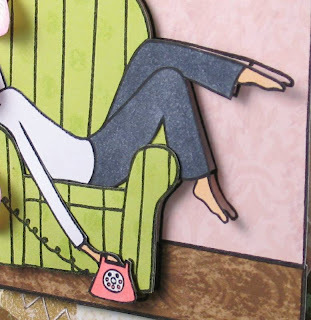 The body with the phone attached was glued over the first layer of the chair (*except* for the arm and phone), then I added a couple layers of scrap CS to the bottom part of the chair, then the paper pieced bottom of the chair, slipped behind the arm. I also added a few layers of scrap CS under the phone to pop it up even more. I hope you like it! Materials used: all patterned paper - K & Co. (Studio K); white cardstock - Georgia Pacific; flowers - Prima; pearl Dew Drops - The Robin's Nest; ribbon - May Arts; dies - Spellbinders; Waxy Flax - Close to My Heart; button - unknown. Today's card is another male birthday card, this time for my father-in-law. I thought he might get a kick out of the DoodleFactory creatures so I thought up this design. I wanted to have Yapples yelling the sentiment but when I looked at him, he was facing left, and I really wanted him yelling to the right (somehow that just makes more sense to me). So I used the MirrorIt! Medium mirror stamp to reverse the direction he's facing. Hope you like this one as much as I do! TFL! Other materials used: sentiment - Close To My Heart (A Birthday Wish set); party hat - Papertrey Ink (It's A Celebration set); white cardstock - Georgia Pacific; red cardstock - Stampin' Up! ; patterned paper - Daisy Bucket Designs; black and red Brilliance ink - Tsukineko; Copic markers; rectangle Nesties; Fiskars tiny flower hand punch. 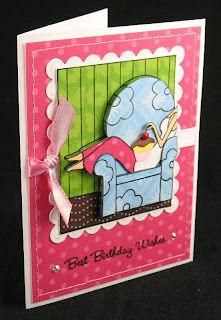 As soon as I saw this Close To My Heart set called A Birthday Wish, I knew I wanted it! The animals have giant heads and I think they're so cute! Not much else to say except the paper is from Imaginisce and the sentiment and hat are also from the same CTMH set. TFL! Hmmm... Can you say that title 10 times fast? Lol! Today's card uses the cutest little bear (?) from the DoodleFactory Country set called Beebo. 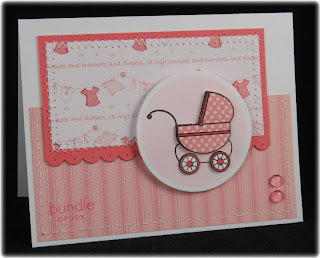 I paired her up with a few different papers from the Nana's Nursery Baby Girl paper pad and some Berry Sorbet cardstock from Papertrey Ink. 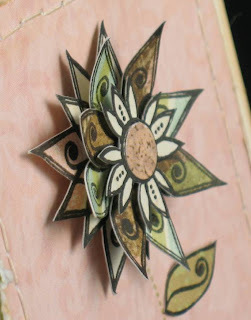 The sketch was taken from the Papercrafts June/July '08 issue. I stamped the entire Beebo onto caramel cardstock, the muzzle area onto white, and the diaper onto patterned paper. I did some coloring with Copics and then cut all three pieces out. I also used a white pen to dot the highlights back onto the eyes. I used a ball-tip stylus to round the muzzle piece, then layered it onto Beebo using some 1/4" hole punches of scrap cardstock for dimension. Then I stuck the diaper down with some thin foam dimensionals. You can see the dimension a little better in this close-up shot. I wanted to piece his clothing with some of this dark blue Bazzill cardstock, but didn't want all that bulk, so I took a tip from this post by Lauren Meader and ran a scrap of the cardstock through my crimper over and over until I could peel it in half. I then smoothed it out and stamped the overalls and hat portions of the stamp onto it. I really like not only that it's thinner than cardstock, but also that it's a little soft and textured, almost like fabric. Thanks for the tip Lauren! I cut him and the carrot top out completely after coloring them in with Copics, and then drew my own carrot freehand on orange cardstock. I cut it out and then sponged a bit of distress ink all around and over the wavy lines. The background is done with the Copic airbrush system. First I tore a post-it note to make an uneven edged mask and sprayed the sky using the chisel end. Then I used the other part of the mask and sprayed the ground, again with the chisel end. Next I took a tip from this post by Cambria Turnbow and sprayed again with the same brown marker, but this time with the brush tip, to create the speckles in the dirt. I think this is a genious idea - thanks Cami! To finish off the card, I punched out 2 word windows and used the Papertrey Ink Simple Alphabet for the word "dream" and the Close To My Heart Sans Alphabet for the "big!" This card will fit into a regular bill envelope, even with his ears sticking off the edge like that. Hope you like it! Updated to add: This month's Show Us Your Sheetload and Win contest is up! I downloaded the July issue of Sheetload last night and decided to work on them tonight. I tried to keep them very simple so they would go faster and I was able to make 9 of them! They were so easy and I have so many supplies left, I may make a sheetload more! I used up a lot of really old Basic Grey Christmas papers and these super old Making Memories metal charms that I bought on clearance years ago. I did a couple variations on the card, but I think this particular layout is my fave. I followed the sketch pretty closely, just adding the scalloped strip and that's it! You can see from this second picture the different charms I used - present, stocking, and ornament. BTW - the sentiment was done with the JustRite monogram stamper! I've seen so many cool samples done with the small alphabet that I had to give it a try myself and I love the look! It was easier than I thought it would be to plug all those little letters in, but I still figured I ought to stamp it about a hundred times before cleaning and putting them all away! Thanks to Sheetload for the inspiration! 1) 10 years ago I was in my second year at law school. I was in a relationship, but we broke up a few years later. I had a part time job reading books onto tape for a blind student in my class. It was kind of boring, but helped me read some of my assignments at the same time! 2) 5 things on my to do list: CLEAN!! That's actually probably all 5 right there as the house is a mess! I also feel like I need to get more stamping done. That's about it right now. Oh, I need a haircut too. I hate getting my hair cut so I wait until it's a complete mess, then wait some more, and some more, and then grudgingly get it done. I think I only get about 4-6 haircuts per year! 3) Fave snacks are whatever I'm craving at the moment. It could be potato chips, cookies, candy... Just about anything! 4) If I was a millionaire I would buy a lot more stampy stuff. Oh wait, I'd need a bigger house to hold it all, so I'd buy that first, move, then buy more stampy stuff! 5) Places I have lived include Oahu, Hawaii. Yup, that's it!! AND... I went from my parents' house to my husband's house, so I've only lived in 2 different places on this island as well!! I went to college and law school here too so I've never been away from the island for more than a couple weeks on vacation. How boring am I?! Yes, it's another MFT card! I hope you're not getting tired of them because I just ordered more from the July release and they're on their way! 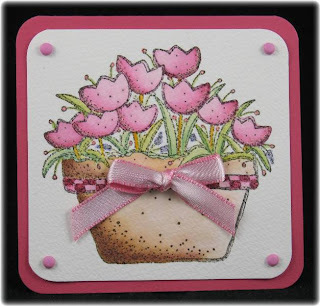 This card was created to play in the MFT July Ambassador Challenge #2 on SCS. The challenge was to do paper piercing somewhere on the project. I did some simple paper tole with the glass and fudge/cherry parts, and also added some dimensional adhesive to just the cherry. The paper piercing was done on the strip of Berry Sorbet cardstock, along the lines of the dovetail cut. I also pierced a bit in the corners of the striped PP, but the pattern is too busy and you can't see it at all. The saying is actually "You're Simply Sweet," but I only stamped "You're Sweet" to fit on my little rectangle. TFL!! Materials used: Here's the Scoop stamp set - My Favorite Things; patterned paper - DCWV Nana's Nursery Baby Girl stack; white cardstock - Georgia Pacific; Berry Sorbet cardstock and ink - Papertrey Ink; Green Galore cardstock - Stampin' Up! ; Black Brilliance ink; white brads - Pink Hedgehog Paper Crafts; Copic markers; Nestabilities. 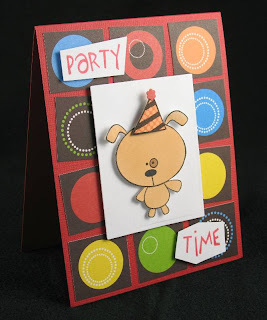 For today's card, I decided to play in the My Favorite Things guest designer challenge for this month. I hope that by playing in all these different challenges, it will help me to be more creative and sharpen up my design skills! I combined 2 different sets to make this card. You may recognize the main image from the Here's the Scoop set. On the bottom blue couch layer, I put a bit of post-it over the ice cream container and spoon so that it wouldn't get inked and then stamped it. I then did a bunch of paper piecing and a bit of paper tole using 4 different papers from the DCWV Blossoms & Butterflies stack. Then I took the What's Up Cupcake set and inked it up with pink for the wrapper portion. I colored the wrapper with a pink Copic, then cut off the pink line from the actual cake part and colored it in yellow. I stamped the frosting separately in brown and cut it out. I also stamped the cherry separately and cut it out. Then I layered everything together and placed it on her tummy area with the stem in her fingers, as if she's pulling it off to eat it first! Here's a close-up shot so you can see some of the dimension. You can also see the Stickles I put on the cherry for some sparkle. I hope you like my idea for changing up this set. You could probably put a bunch of different things in her lap, like a present that she's starting to unwrap or some other kind of dessert (and then you could leave the spoon). I was so honored to receive a couple more awards from my sweet SBS-13 sisters! I got this award from both Karen and Richelle. Thanks for thinking of me gals - these really made my day! As I've posted before, it's way too hard for me to nominate bloggers for awards because my blog-hopping list is already a mile long and I keep adding to it everyday!! I hope that my commenting on people's art is enough to show how much I admire and appreciate all the inspiration out there in blogland! Thanks!